I’ve never been big on Halloween, personally, but even in advance of having a little kid I made peace with it. I’d go for the simplest costume I could imagine. For many years this meant wearing a colorful Superman t-shirt underneath a half-buttoned regular overshirt, which combined with my short dark brown hair and my eyeglasses made me scrawny Clark Kent. This year I’m going for a costume that’s even simpler still: a mere safety pin transforms me into Theodore Twombly, the character played by Joaquin Phoenix in the excellent 2013 Spike Jonze film, *Her*. With his cellphone suspended in breast pocket, Twombly can go for walks with his beloved, a highly advanced AI voiced throughout the film by the disembodied Scarlett Johansson. She in turn views the world through Twombly’s phone’s camera. And, no, I didn’t grow a mustache for the occasion. One of the great pleasures of listening to an active electronic musician for an extended period of time is observing how they bring new equipment into their orbit. There is the question of how that equipment, in turn, informs their work. There is also how they achieve their now familiar sounds with unfamiliar tools. The musician Dustmotes’ adoption of a new percussive-oriented sampler is a case in point. The London-based Dustmotes, also known as Paul Croker, has been making elegantly gritty instrumental hip-hop at least since 2011, which is the earliest credit on his discogs.com page, and also the first year I wrote about his music. His music often features a slightly drifting rhythm, a beat missed here, a tempo ebbing there. He regularly explores gentle sounds on well-circumscribed repeat against muffled beats. Playing with a new tool, the Elektron Digitakt, he recently posted a short video, which he dubbed a “Spontaneous live performance” in the brief accompanying note. It has all the modesty of his earlier work, with a newfound level of grit and glitch. The video was shot overhead, so you can watch as he goes. Even if you’re not familiar with the Digitakt’s interface, you can infer correspondences between action and sound — how a knob adds a new effect, or changes the pitch, or welcomes additional elements. It’s a great piece. Video originally posted to Dustmotes’ YouTube channel. More from Dustmotes at about.me/dustmotes and twitter.com/dustmotes. And then, over on Bandcamp, the Klirrfaktor uploaded a nine-track album, Lost Identity, completely recorded on a single piece of software, one that is still deep in beta. 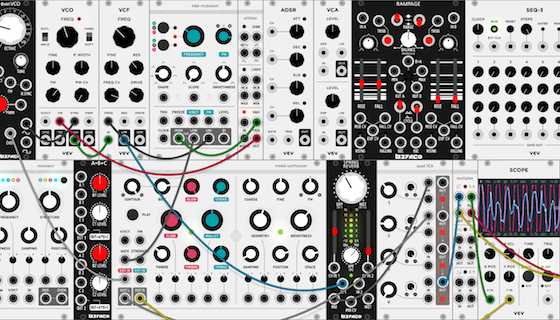 Named VCV Rack, the software is a virtual modular synthesizer developed by Andrew Belt and contributed to by a growing number of module creators. You could argue that with numerous modules, VCV Rack isn’t exactly a single instrument, but Klirrfaktor gets points for putting it to substantial use so quickly — and for eschewing rote 4/4 rhythm tracks in favor of dank industrial spaces and ominous sound design. Currently in version 0.4, VCV Rack (shown above) offers a variety of true basics, like oscillators and mixers, as well as adaptations of more specialized gear, like granular synthesizers and matrix sequencers. Both VCV Rack and the Klirrfaktor album are also entirely free. You can download VCV Rack at vcvrack.com. And if you make something you’re happy with, there’s a compilation due out that you can contribute to, details at switchedonrack.com. Album originally posted at theklirrfaktor.bandcamp.com. More from the Klirrfaktor at twitter.com/TheKlirrfaktor and youtube.com/TheKlirrfaktor. Create a piece of music by thinking of the structure of a bee hive. Tracks will be added to this playlist for the duration of the project. This project’s deadline is 11:59pm (that is, just before midnight) wherever you are on Monday, October 30, 2017. This project was posted in the morning, California time, on Thursday, October 26, 2017. Step 1: Consider the bee hive. 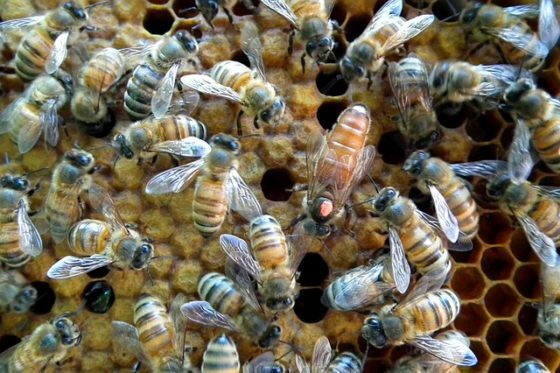 Think about its structure, the activity it contains, how the hive lends form to that activity and how the activity contributes to the hive’s form. Step 2: Create a piece of music that is based on the structure of the bee hive. Step 1: If your hosting platform allows for tags, be sure to include the project tag “disquiet0304” (no spaces) in the name of your track. If you’re posting on SoundCloud in particular, this is essential to my locating the tracks and creating a playlist of them. Deadline: This project’s deadline is 11:59pm (that is, just before midnight) wherever you are on Monday, October 30, 2017. This project was posted in the morning, California time, on Thursday, October 26, 2017. Title/Tag: When posting your track, please include “disquiet0304” in the title of the track, and where applicable (on SoundCloud, for example) as a tag. This project’s deadline is 11:59pm (that is, just before midnight) wherever you are on Monday, October 23, 2017. This project was posted in the early evening, California time, on Thursday, October 19, 2017. Pay tribute to the Roland 303 by doing something that is apart from how you think it was intended to be utilized. Step 1: This is the 303rd weekly Disquiet Junto project since the series of compositional prompts was founded the first week of January 2012. 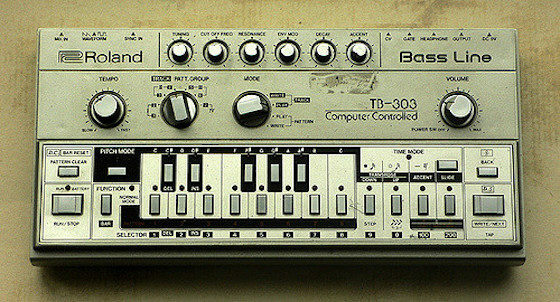 Naturally, we’re paying tribute to the Roland TB-303. There’s also, of course, Roland’s own tribute, the TB-3. Step 3: Record a short piece of music that is somehow apart from how you think the 303 was intended to be utilized. Step 1: If your hosting platform allows for tags, be sure to include the project tag “disquiet0303” (no spaces) in the name of your track. If you’re posting on SoundCloud in particular, this is essential to my locating the tracks and creating a playlist of them. Deadline: This project’s deadline is 11:59pm (that is, just before midnight) wherever you are on Monday, October 23, 2017. This project was posted in the early evening, California time, on Thursday, October 19, 2017. Title/Tag: When posting your track, please include “disquiet0303” in the title of the track, and where applicable (on SoundCloud, for example) as a tag.